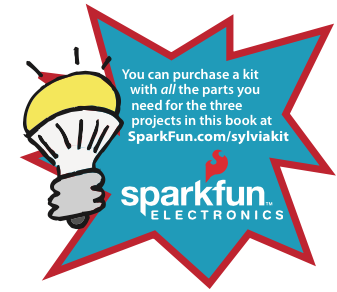 Sylvia’s Project Kit – Get a kit of all the parts you need for the projects in this book. Sparkfun – Parts, kits, and resources including Arduino tutorials. 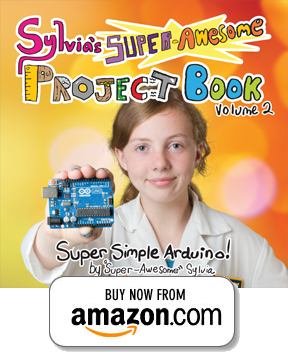 Adafruit – Parts, kits, videos, and a series of guides to learn more about the Arduino. MakerShed – Purchase Arduino boards and accessories. Arduino website – The home of the Arduino. Contains code, drivers, troubleshooting, and more. Instructables Arduino Projects – Offers a number of Arduino projects at varying levels of complexity. Lilypad Arduino – An Arduino board for projects using textiles and wearable electronics. Getting Started with Arduino – A handy little guide to getting started on Arduino by Massimo Banzi, the father of Arduino. Books for Makers, Parents of Makers, and Teachers!